My friend Chaz has a saying about Modern: “The best games I’ve ever played were in Modern; and the worst games I’ve ever played were in Modern.” It makes sense. One the one hand we’re witnessing what is most likely the single-most diverse Magic format of all time, where every possible archetype and play style is represented by multiple decks. On the other hand games can be over in a matter of precious few turns, and “non-game” hosers like Choke, Blood Moon and Ensnaring Bridge run rampant. Meanwhile people invest countless hours and no small quantity of money into strategies that at a moment’s notice can get felled by the banhammer. Wizards has long been aware of these potential pitfalls in the format. With the establishment of the turn four rule, and more recently their decision to retire Modern from the Pro Tour, Wizards has demonstrated its commitment to keep these problems in check. Many people have suggested other fixes, from 20-card sideboards to the introduction of choice reprints from Magic’s past, up to and including Legacy powerhouse and resident policeman Force of Will. I’ll start this article by clearly stating that I think Force is too good for Modern (to say nothing of Standard, which it would have to go through first). A direct reprint of Force of Will could well catapult blue to Tier 0 “only-deck” status in Modern, or result in other hideous effects like combo pilots using it to protect their turn one kills. What I want to discuss today is the possibility of a new Force-like card that could occupy the role of fair policeman in Modern. Can such a safety-valve card be designed, and would Modern even benefit from its introduction? Obligatory disclaimer time: This is just one man’s opinion. We’re operating in some pretty hypothetical, unproven ground, and my claims are sure to be met with some vigorous and well-reasoned dissenting opinions. Ultimately I’m more interested in starting a conversation than I am in being right; so feel free to sound off in the comments. First of all, what exactly are we trying to fix in Modern? It’s certainly not diversity. Right now Modern is posting one of the most varied metagames ever. We can all agree this is one of the true treasures of the format, something to be cherished and further cultivated. And the attendance numbers show a format bursting with a vibrant community and ever-expanding playerbase. Absurdly high card prices reflect the community’s love of the format, and it seems to gain in popularity constantly. But Modern is not without its problems. Non-interactive games often rule the roost. This has led to both an excessively large banlist and the overtaxing of sideboard space. Certain things on the Modern banlist won’t give anyone pause. From utter abominations like Skullclamp and Mental Misstep which should frankly have never seen the light of day, to potential format-warping bombs like Stoneforge Mystic or Umezawa’s Jitte which can invalidate entire strategies merely by existing, there’s plenty on the Modern banlist that merits its spot. But what about Blazing Shoal? Hypergenesis? How about old mainstays Splinter Twin and Birthing Pod? Some of these cards look downright odd to see banned. If they could be released from purgatory without threatening turn four rule violations or format diversity, they might enable new archetypes (or the return of old beloved ones). Remember, the turn four rule centers around a strategy’s dominance, not merely its potential to kill too early. If a free counterspell variant can keep strategies like that in check, they might be able to become a part of the Modern family of decks. Conversely, as the Modern card pool continues to grow and more two-card combos inevitably get introduced, we may see the banlist balloon even further. Since the beginning of the format, more cards have been added to the banlist than removed. We can expect this to continue unless some more natural safety valves can be built into the format. Modern’s wonderful diversity doesn’t come without a downside. The preponderance of explosive linear decks puts an enormous strain on sideboard spots. While plenty of general answers exist, from Destructive Revelry, to Negate, to Abrupt Decay, they’re not always sufficient to stem the onslaught from decks with such highly-focused and consistent gameplans as Burn, Bogles, or Tron. Punching holes in strategies like these is difficult using “normal” Magic cards because the axes they play on are so specific. The problem becomes even more pronounced when the decks are capable of fast kills, which can render something even as universal as a two-drop kill spell anemic. As a result, Modern is rife with narrow, silver-bullet type cards that make or break matchups by themselves. We’ve come to expect the blowout hate card out of nearly every archetype’s sideboard. But you can only fit so many Rest in Peaces, Rending Volleys, Fracturing Gusts, Crumble to Dusts, Kor Firewalkers, and Spellskites into your sideboard before you run out of space. This leads to what I like to call “sideboard roulette”—make a stab in the dark at what you expect to face, jam a pile of one-off answers in your board, and hope the matchup stars align. The problem doesn’t even end there though. Once you’ve successfully predicted your opposing archetype(s) and brought in the knock-out game-winning hoser, you still have to draw it! Entire matches can be predicated on this minigame of who can topdeck or mulligan into the one card that matters—leading to the “worst games ever” so maligned in Chaz’s quote above. This problem was one of the central issues with the Modern format that Paulo Vitor Damo da Rosa tried to address with his suggested 20-card sideboard. Could another solution be the introduction of a truly universal answer to linear strategies modo grosso? Could a Force of Will analog put enough pressure on these “unfair” decks without crushing them completely out of the format? First of all, a clear understanding of Force of Will‘s role in Legacy is necessary to our discussion. It’s a well-known fact that Brainstorm is the defining card in Legacy, around which the entire format is warped. By now countless words have been written about this iconic card, including the effect its hyper-efficient card selection has on format diversity. Make no mistake—Brainstorm is the reason for blue’s dominance in Legacy, and the principle obstacle to the success of fair non-blue decks. While Legacy players tend to love their Brainstorms (I should know—I’ve cast many myself) you could make a strong argument that it’s problematic and unhealthy for the format. The same can’t be said for Force of Will. To the eye of the uninitiated, it might seem like a fundamentally broken card that unfairly benefits blue players. To those of us who cut our chops in Legacy, we know it serves a much more noble purpose—keeping broken things at bay. The great thing about Force in Legacy is that it’s actively bad against fair strategies. You will frequently side it out against decks like Jund, Miracles or Zoo that aim to play a more “conventional” game of Magic. In the face of a Dark Confidant, or a constant string of individual must-answer threats from the likes of Zoo or Death and Taxes, card disadvantage can be a death knell. Thus the fair, non-blue strategies get a double boost from Force of Will‘s presence in the format—they get to prey on the blue permission decks, all while relying on them to keep busted nonsense in check. The result is a kind of “rattlesnake” effect on glass-cannon strategies. While highly-linear and non-interactive decks do exist, they tend to perform poorly. Decks like Manaless Dredge and Belcher don’t require bannings because their metagame share can never get too large and at any given tournament they will eventually run afoul of the blue policeman who stops their turn-one kill with a turn-zero counterspell. Because this safety valve is an omnipresent force in the format, other decks don’t have to cram their sideboard with narrow, single-purpose answers to an interminable laundry list of broken combos. Even a ridiculously overpowered combo deck like Ad Nauseam (with Dark Ritual, Ponder, and Brainstorm, no less) sometimes suffers from poor metagame positioning. The upshot of all this, generally, is better Magic played and had by all. That isn’t to say problems don’t exist in Legacy. Certainly the format has its own issues, and with Modern Wizards has the luxury of tailoring the format from scratch to function the way they want. So far careful bannings and application of the turn four rule have done the trick to keep Modern healthy and diverse. But is there a better way? Could more safety valves like Force of Will be designed to fit the Modern format and keep broken combos down without oppressing fair strategies or making blue the must-play color? In many ways, we already have our hero. The role that Force of Will occupies in Legacy is largely taken care of by Thoughtseize. It’s very good at taking apart linear strategies, especially when paired with Jund’s supporting cast of Liliana of the Veil and Inquisition of Kozilek. BGx has long been the de facto policeman in Modern, and there’s nothing inherent about the color blue that necessitates that it take on that role. Thoughtseize has a similar dynamic as Force of Will in that it gets worse against fair decks. It often comes out in the mirror, and good-old fashioned aggro decks like Gruul or Merfolk aren’t really too concerned about it, what with their replaceable threats. All that is great, and honestly I think Thoughtseize is doing an excellent job of keeping unfair strategies down in Modern. That being said, there are certain things Thoughtseize just can’t accomplish. For one, it can’t interact on turn zero. Turn one kills in Modern are obviously rare, but not beyond the realm of possibility out of decks like Amulet Bloom or Grishoalbrand. Again, the mere possibility of such kills isn’t sufficient to merit a ban (as Grishoalbrand’s continued presence testifies), so if we can keep these strategies relegated to the Tier 3 category, their proponents can still have their fun without ruining it for everyone else. The turn zero counterspell is the gold standard of stopping turn one kills, something Thoughtseize can’t boast when you lose the die roll. Second of all, and more importantly, Thoughtseize can’t stop topdecks. On the one hand, this means that some number of “fair” games will still end with a broken combo piece drawn late-game. On the other hand, it puts weird strains on deckbuilders to have their own unfair combo finishes to close out games after their temporary disruption has bought them time. If Thoughtseize is doing good work, and Force of Will is too good for a reprint, could other cards be designed to fill the intervening space? If our aim is to make a turn zero counterspell, there are some pretty huge design hurdles to clear. We have to make sure it’s good against combo, but mediocre against fair decks. But it can’t be stone awful against fair decks either (looking at you, Mindbreak Trap) lest it see no maindeck play and fall prey to the same sideboard roulette problem of other anti-combo hosers. Finally, it can’t be good in the combo decks themselves. Pact of Negation is already a monster in decks like Ad Nauseam, Amulet Bloom and Blazing Shoal Infect (it’s no coincidence two of these decks have already been banned) and the idea of a combo deck with eight copies of that effect is positively bone-chilling. You may pay 1 life and exile a blue card from your hand rather than pay Force of Willpower’s mana cost. Counter target spell that doesn’t target anything on the stack. There are certain things this card does well. It provides the critical turn zero answer to a broken combo. It’s good enough for maindeck play, but lackluster against fair decks. It’s not great at protecting combos from opposing counterspells. It has serious problems too, though. 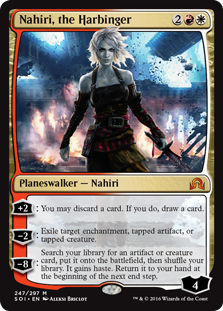 It can be used to protect any combo piece that needs to sit on the battlefield after it resolves (Nahiri, the Harbinger, for example). It’s likely to make control decks a little too good at answering everything, all the time. It creates a “shields-never-down” situation where resolving a spell is never guaranteed and the blue player can deploy things at their leisure. That last issue is one Mark Rosewater has publicly mentioned as bad design on repeated occasions, and by itself probably enough to guarantee a card like this never sees print. This is to say nothing of the brutally warping effect a card like this would have on Standard, a format which Wizards has proclaimed shall be the gateway to all Modern playability. Wizards hasn’t tried to make a free counterspell since Mindbreak Trap in Zendikar (unless you count Mental Misstep—shudder) and there’s good reason for that. The potential for format warping and oppressiveness is real. I still think a balanced design might be feasible, but ultimately a safety valve that helps combat linear brokenness doesn’t have to be a counterspell at all. Thoughtseize points to other avenues in card design (and colors) that can occupy this space. My hope is that Wizards will endeavor to create more cards in this vein that can act as generalized stalwarts against the more non-interactive elements of the game. They are, after all, brilliant game designers. If they can manage to find that perfect balance between too good and too narrow, we might finally see the Modern banlist start to shrink. Modern doesn’t need Force of Will. Give us those two and everything else fixes itself. This. Fast combo decks are not the problem in modern and thus FoW isn’t necessary. 100% on counterspell. Not sure about the land card – seems like a narrow hoser for Tron? What else is problematic in this space now that 8-sol land Eldrazi doesnt exist? Mostly because wizards has just absolutely killed LD and mana disruption in modern, which is fine, but there are also several decks – usually problematic, that take advantage of this – Tron, Eldrazi, etc. Should probably address lowering costs too, maybe: If a land would tap for more than one mana, it taps for one mana instead, if a spell or effect would reduce the cost of a spell or activated ability, it does not. Maybe it is just as simple as reprinting Counterspell. That solves the topdeck problem nicely. Counter target spell unless its controller pays (2). Sacrifice two lands, then you lose X life where X is equal to the number of land cards in your graveyard. If ~ is in your opening hand, you may begin the game with it on the battlefield. Players can only cast one spell per turn. Target player can’t cast noncreature spells this turn. Land bomb honestly is a combo protector card. It won’t stop anything degenerate only enable them. Target player draws 2 cards and discards 4 cards. You may exile a red card from your hand instead of paying this cards mana cost. In this way, if ad naseum or another fast combo deck uses too many cards in hand for their combo, you can counter it instant speed t1, while still being able to shut down topdecked wins late game. Still, I think this article is great, but wrong in a basic principle. Modern does not need a t1 counterspell because t1 wins dont exist, not really anyway. We need a basic form of interaction that deals with combo’s which cannot be easily countered, like a cheaper last word. Flusterstorm is a good example of this, and I think could be a card that can regulate the combo decks fairly well. People in the comments are echoing this sentiment, and in retrospect it does seem like a zero-mana counter isn’t necessary. Still, the addition of some kind of police cards could benefit the format. Flusterstorm seems like a great idea (although Storm precludes its printing in Standard). you may remove a blue card in your hand and from the game rather than pay force of (whatever)’s mana cost. You may only cast force of (whatever) if it is the first spell being cast by you this turn. The design of this card allows decks to defend themselves from turn 0 kill while at the same time preventing combo decks from using it to protect their combo. Granted, there could be a way people set up the combo on the previous turn, untap, and then be able to play this spell because they haven’t cast a spell in order to combo off, but I like this version a lot for its simplicity. Not sure I followed your thought progression… thoughtseize is like force except for turn 1 kills (which are possible in theory but won’t happen often enough to be a cause for concern) and topdecks. Again it’s probability – your opponent might draw the card you just seized – if they do oh well, lucky draws happen. So I don’t believe the gap you described is meaningful – the two scenarios where seize isn’t good enough are obtusely unlikely. You would need a better argument for why modern needs another police card like or better than seize – the obvious being we can’t all play black. But your point didn’t seem to be that we need better police cards in other colours, it was that we need better answers to turn 1 kills and topdecks… Also you don’t even mention disrupting shoal. I probably oversold the question of turn-zero interaction. I think Thoughtseize is a great model for police cards in Modern, but the topdeck problem is real. Also, it’s just one card, and Modern can probably benefit from more. Certainly it doesn’t need to be a free counterspell. As for Disrupting Shoal, it’s just too weak for mainstream maindeck play. You are going to talk about Modern force of will and omit Disrupting shoal? Temur Delver pilots enjoy shoal quite a bit. Its a mistake to completely ignore it. Shoal is a fine roleplayer (I understand that Merfolk has tinkered with the card as well). But it’s not good enough generally to become a real staple, which is necessary for police cards to do their work. Otherwise it’s just one single bad matchup for the degenerate deck. I don’t think Modern needs a Force of Will, truth be told. I think highly linear decks can be broken down into two groups–creature based, like affinity or infect, and spell based, like storm or Grishoalbrand. For creature-based, we need Innocent Blood. While it’s slightly weak to affinity, affinity has enough hate post board. But Innocent Blood would help against infect, burn, delver, etc. Counter target spell. At the beginning of your next upkeep, you may pay UU. If you do not, discard two cards. It does seem like Innocent Blood (and possibly Counterspell) would be great additions. What he said. Innocent Blood and Counterspell should do the trick. Does it have to be turn 0? What about turn 1? As an additional cost to cast ~ exile a non-land card from your hand. Counter target spell. This doesn’t have the huge deck-building restriction that Force of Will does, which I think reduces diversity in Legacy. It also isn’t quite as large a tempo play though, as it does cost a mana, so it seems to be more in line with Modern’s power level. Mental Misstep wasn’t so bad. Bring it back. Then you can being back Bloom and Twin and Pod without any problems. Misstep would be a disaster. For one, most Modern police cards cost one (IoK, TS, Path, Bolt), and Misstep just gives unfair decks more ways to fight these cards. Second, this devolves the format into Misstep wars: can you even imagine Infect running 3-4 of those maindeck to protect their dudes in a more controlling, Legacy-style build? The card was horrendously broken in past formats and unbanning it would be a nightmare. Although this might not be true in your case, I mostly assume that people who advocate for this unban have never actually played with the card. It’s horribly format-warping and doesn’t benefit fair decks nearly as much as people believe. The biggest thing is to have answers of some sort in all colors. I think each color should have a cheap removal spell of some sort, as well as a way to disrupt or protect against combo. That way BG doesn’t have to be “the police deck”– instead, each color can respond in some fashion. As an example of a way for white to protect against spells. Until end of turn, if you would lose life, you gain that much life instead. Seconding Sheridan’s response. I can speak from experience seeing Misstep in action in Legacy. It’s simply one of the most broken cards of all time. It’s up there with Tinker and Yawgmoth’s Will. Absolute non-starter. The card allows WotC to print a meaningful counterspell that nonetheless does not quite make an all answers card given the presence of big mana decks in the format. Since Tron lost so much of its inevitability to U mages given the recent unbannings, a card that answers most threats except those played by big mana decks seems balanced and healthy while also being a necessary all-but-unrestricted blue answer. I like that card. Main concern is standard, but most decks these days play some number of fives and sixes so it’s probably fine.